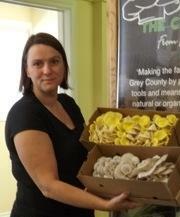 Cindy Phillips, owner of Rob Roy Market Garden with a representative from 100km Foods Inc. The official opening of the Food Distribution Hub in Flesherton will be Monday, November 10 in Flesherton. ‘We are pleased to support the development of this much-needed facility,’ says Grey County Economic Development Officer for Local Food, Philly Markowitz in a news release. The Food Distribution Hub is a transshipment point between local farms who are members of the Chefs’ Forum and commercial buyers. Food will be picked up from area farmers twice a week for distribution locally, as well as into the Greater Toronto Area. ‘The central hub location will make it more efficient for us and the farmers we already serve,’ says Paul Sawtell in a news release. 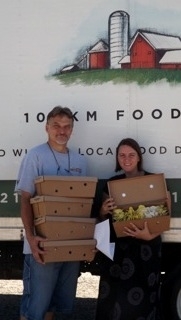 Sawtell is the owner of Toronto-based food distribution company, 100km Foods Inc.
Cindy Phillips, who owns Rob Roy Market Garden in Grey County, which has been in operation for three years. Presently, Reader says there are more than 50 members from farms and about 75 buyers. All members are asked to RSVP if they would like attend the official opening and launch party for the Food Hub on November 10 at 4:30 PM. Refreshments will be served in the Village Greens Café, at 774310 Highway 10, North of Flesherton.